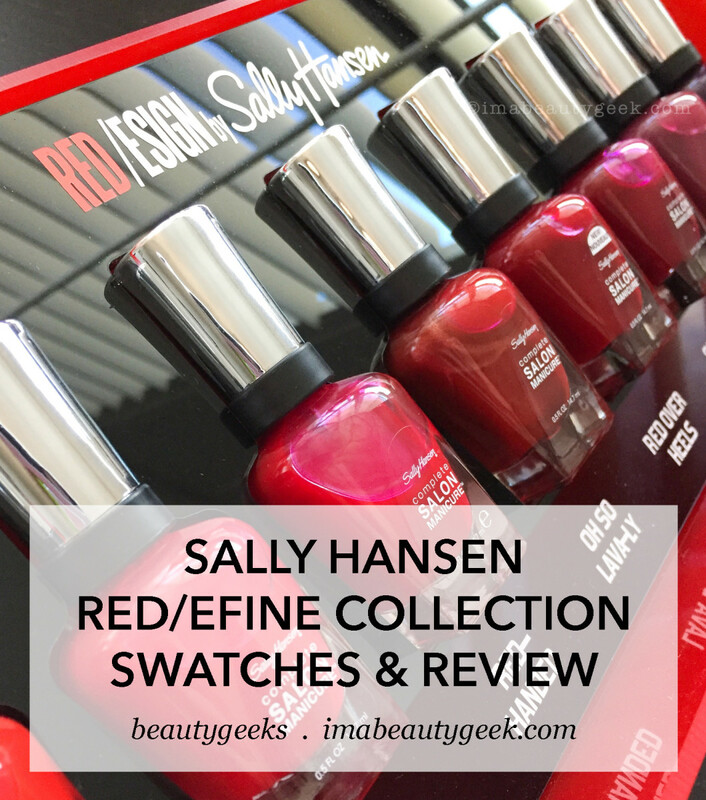 Manigeek is seeing red, red, red, with a side of top-coat fun from her stash. Hi fellow nail nerdies! Lookit me! 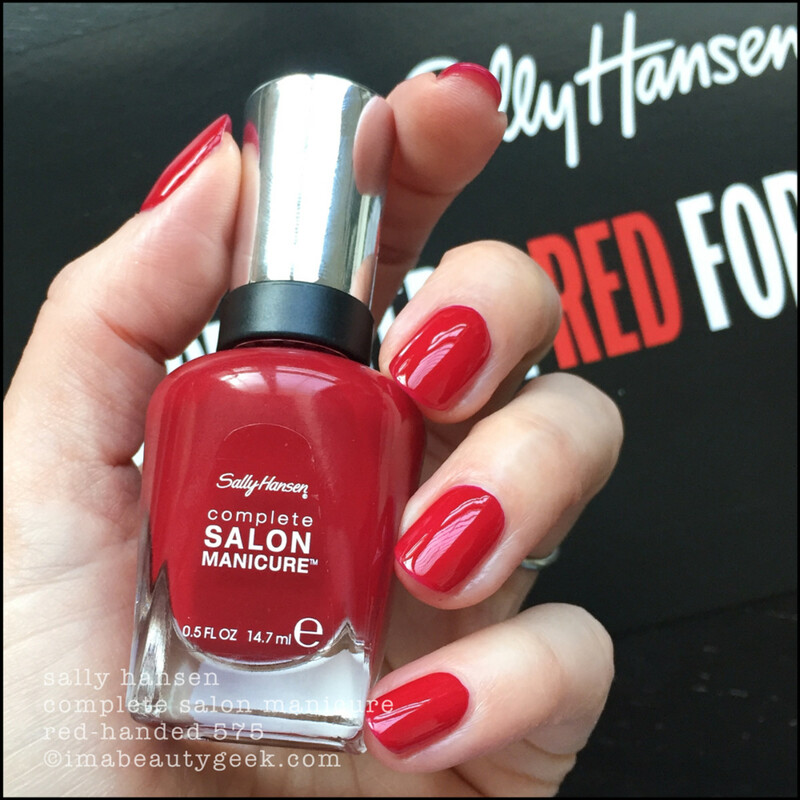 I’m all up in the new Sally Hansen Red/esign Collection that just launched here in Canada! What is it? It’s a 9-shade collection of some red (and also not red) Complete Salon Manicure shades. 5 of ‘em are new and 4 of ‘em might look familiar. Wanna seeeee? 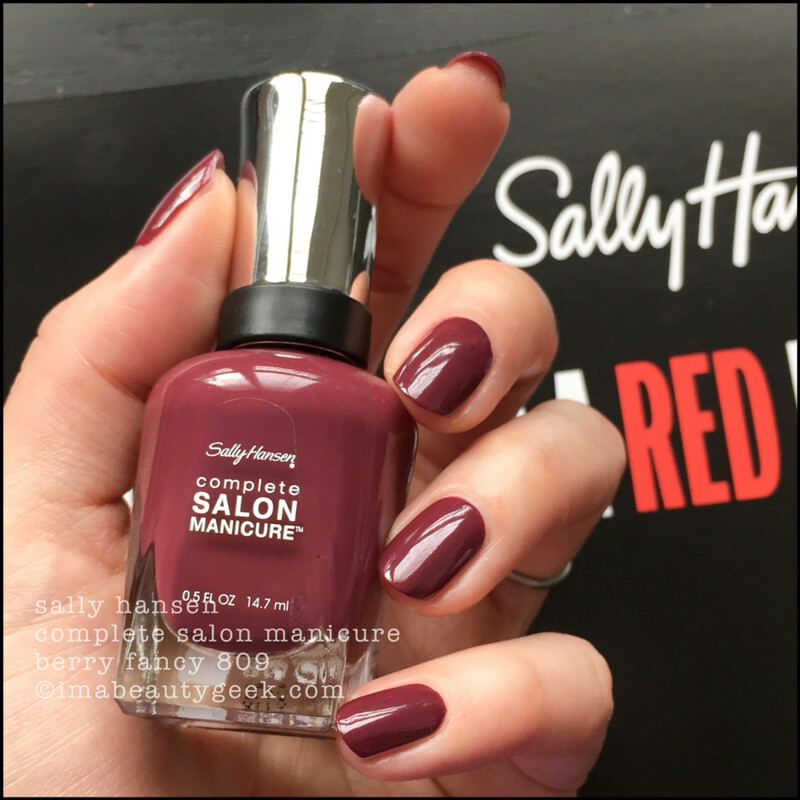 Sally Hansen Cherry Delightful 808 – Red/esign Collection 2018 (above). 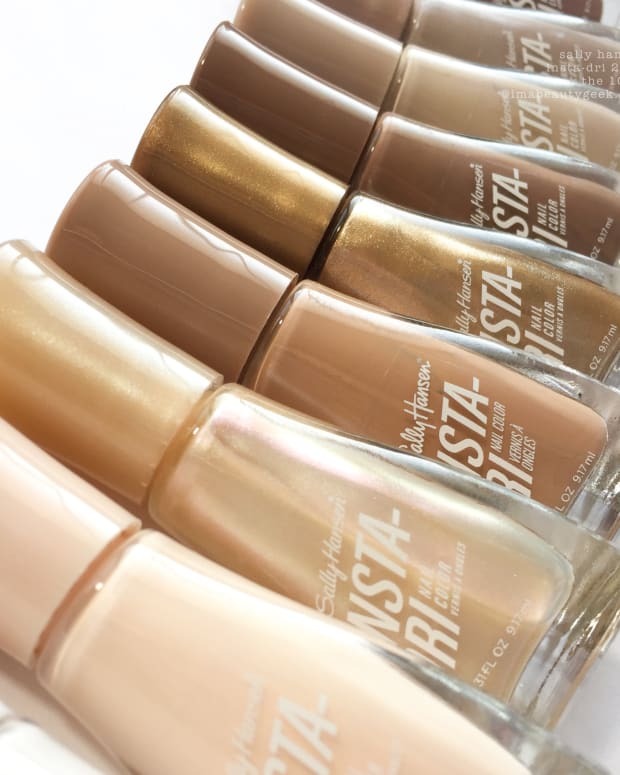 That’s 2 quick coats of what Sally H is calling their new “universal shade that flatters all skin tones”. Does it? I dunno – I only have one skin tone. But I’ll tell ya what, the formula is like buttah and she sure does look like $$$ on my nails! Sally Hansen Cherry Delightful w Hot Ticket You’re So Hot and Gold (above). And just because I could, I blinged it out and gave it a side of salad. 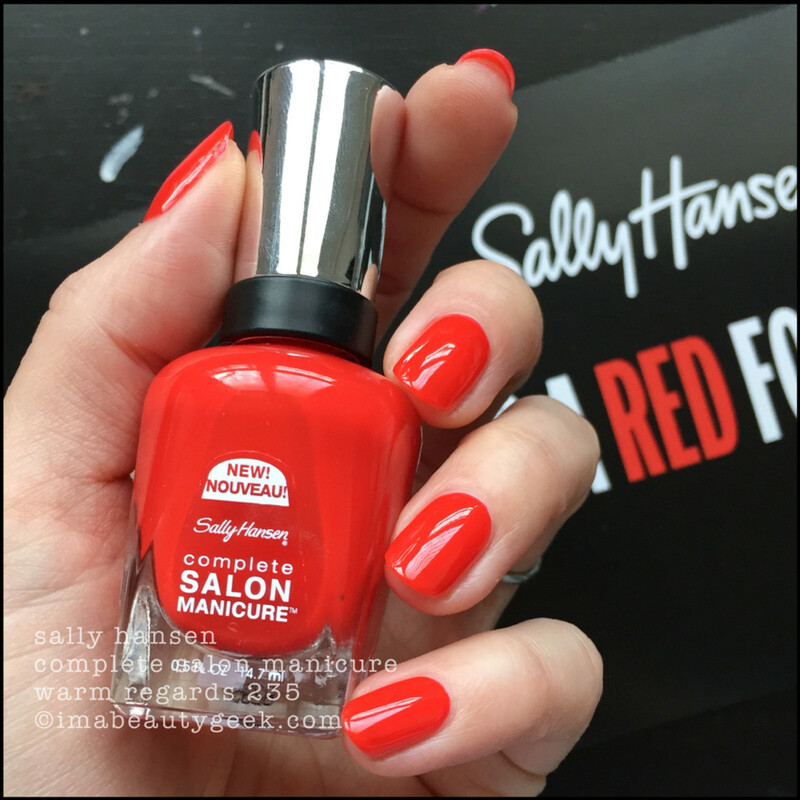 Sally Hansen Warm Regards 235 – Red/esign Collection 2018 (above). This one is kinda crelly. I still had VNL (visible nail lines) in 2 coats so this is 3. If you look really close, I still show slight lines, but this’ll do. 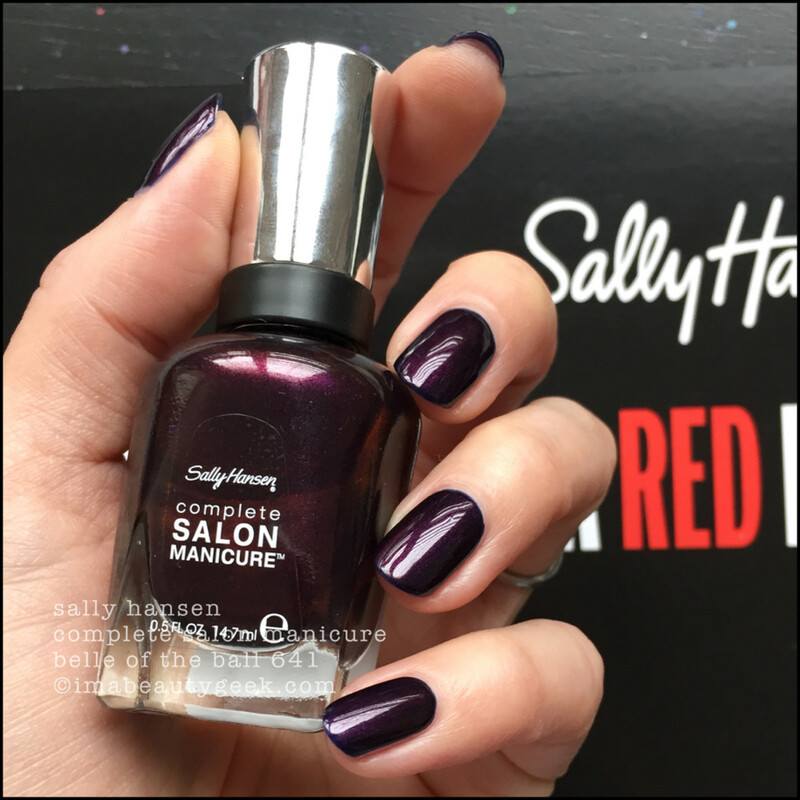 Sally Hansen Tutu Pretty 821 over Warm Regards 235 (above). What did I find to slap over this pretty? A Tutu! I know, whodathunk it’d turn out so whack, right? Sally Hansen Luxe Lace Eyelet over Red My Lips 231 (above). Oh hey, it’s Christmas. 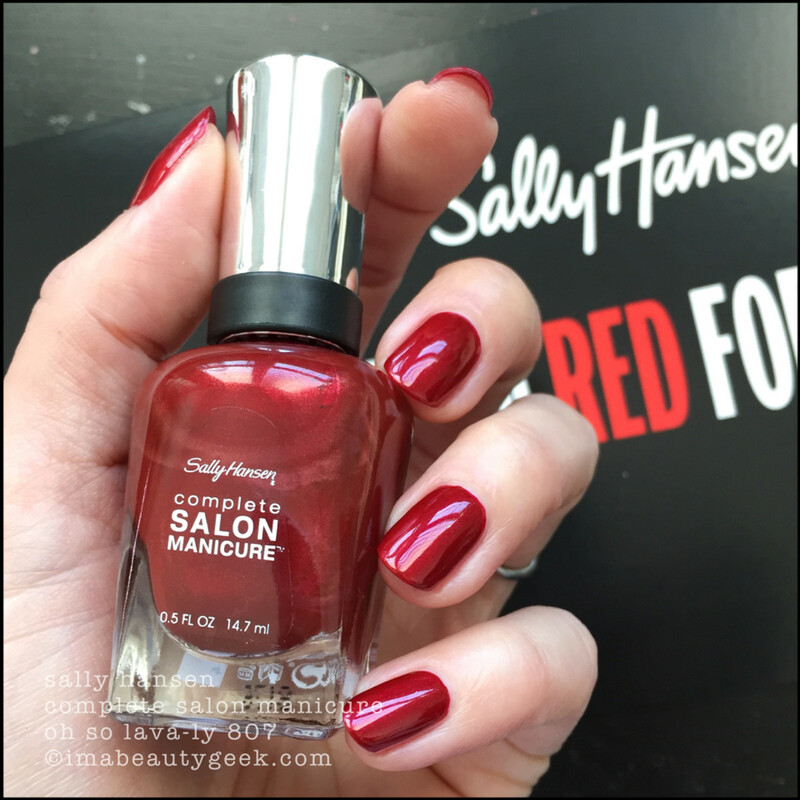 Sally Hansen Red-Handed 575 – Red/esign Collection 2018 (above). 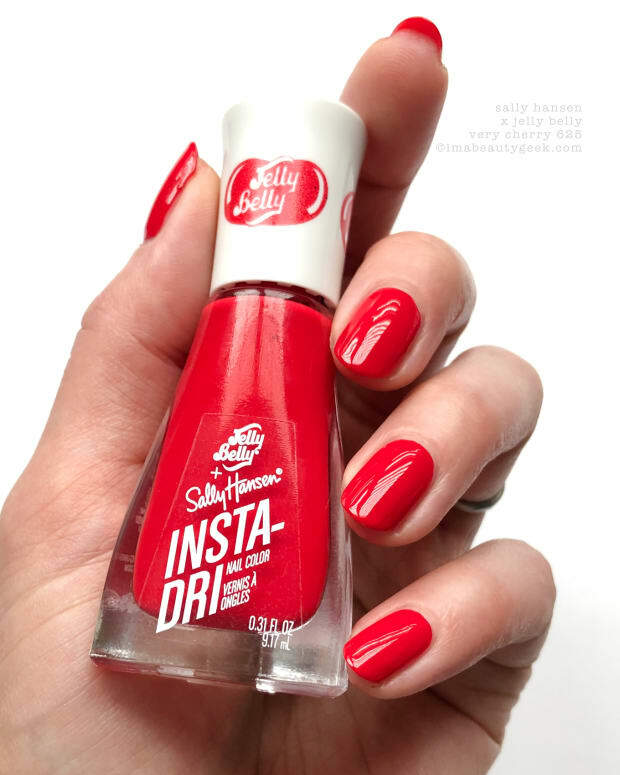 This is the second of the 5 new shades and if you need a little more blue in your red, this is the one for you. That’s 2 coats. Oh, by the way, you don’t want to twist any of these on removal or you’ll have red cuticles and sidewalls for daaaaaays. 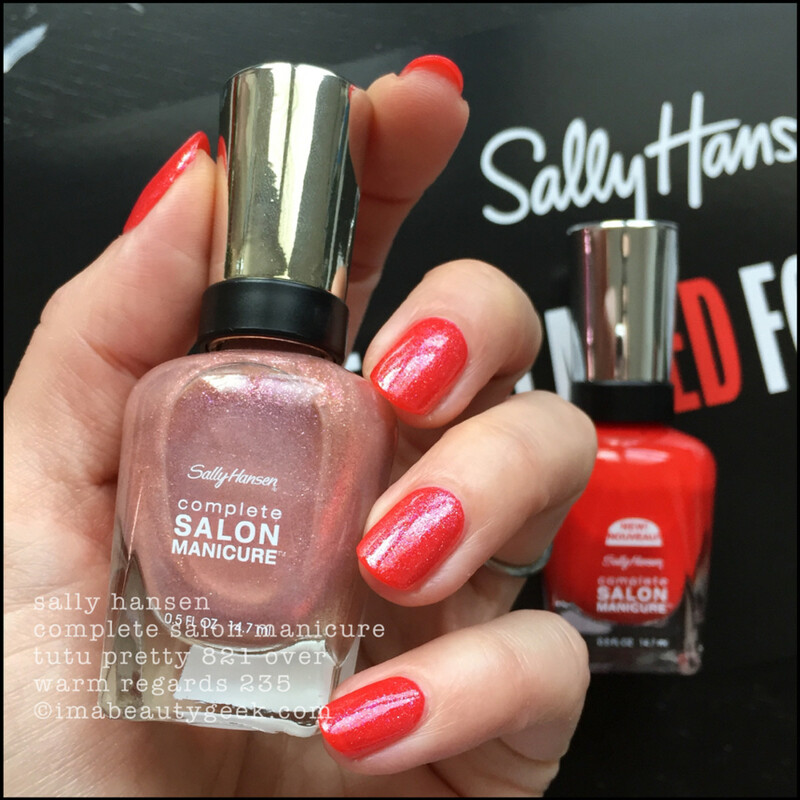 Sally Hansen Oh So Lava-ly 807 – Red/esign Collection 2018 (above). Another new shade and this one is smashing! It’s stuffed with a whole bunch of colours of microshimmer that mostly end up reading coppery. It’s a lovely, wintery, almost-bricky, burnished red. 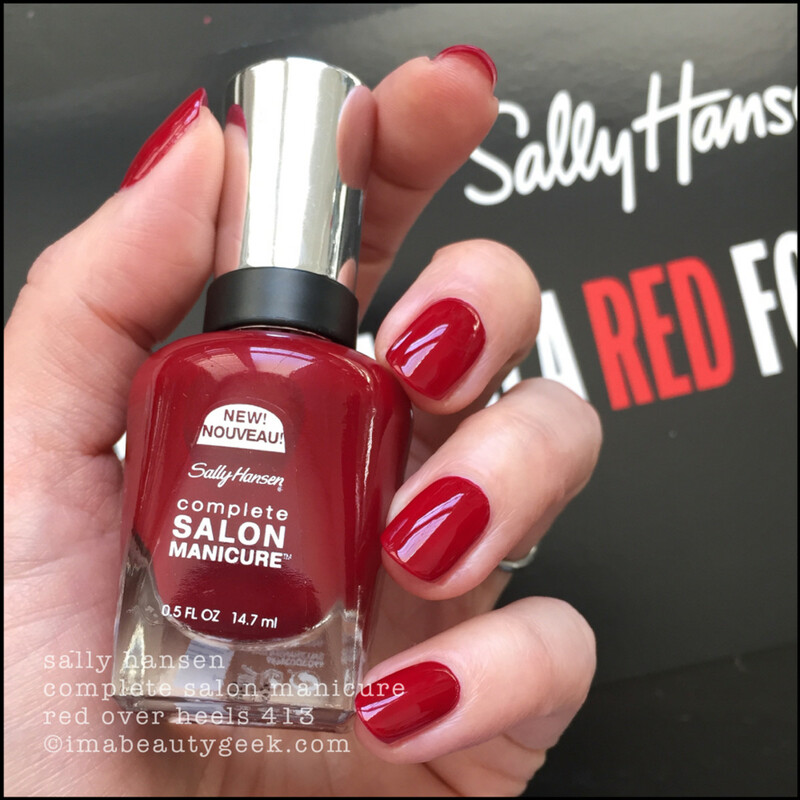 Sally Hansen Red Over Heels 413 – Red/esign Collection 2018 (above). Interestingly, this bottle has a “New! Nouveau!” label on it but it ain’t new or nouveau. It old. It 2 coats. It giveth me the lobster hands. Sally Hansen Red Over Heels w Revlon Matte Pearl Glaze (above). Huzzah!! 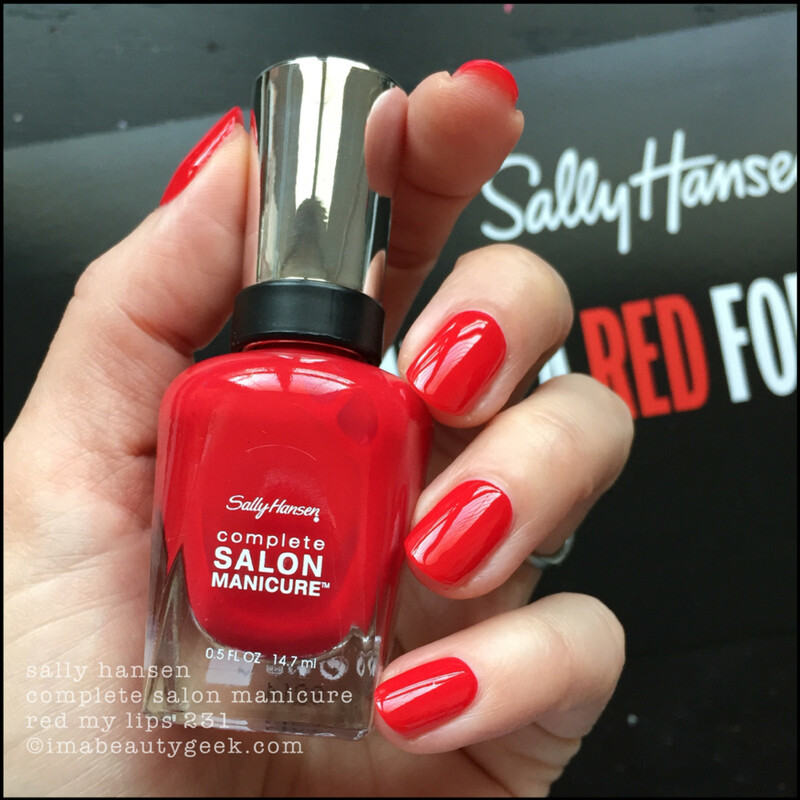 Sally Hansen Society Ruler 418 – Red/efine Collection 2018 (above). She’s 2 coats and she’s another newbie that’s right bang in burgundy-red territory. You could probably get away with doing a single coat for most of these, but two is better; you get better depth of colour (and better shine) with 2. #TrustMe. Sally Hansen Snow Globe over Society Ruler (above). Oh look! More Christmas! 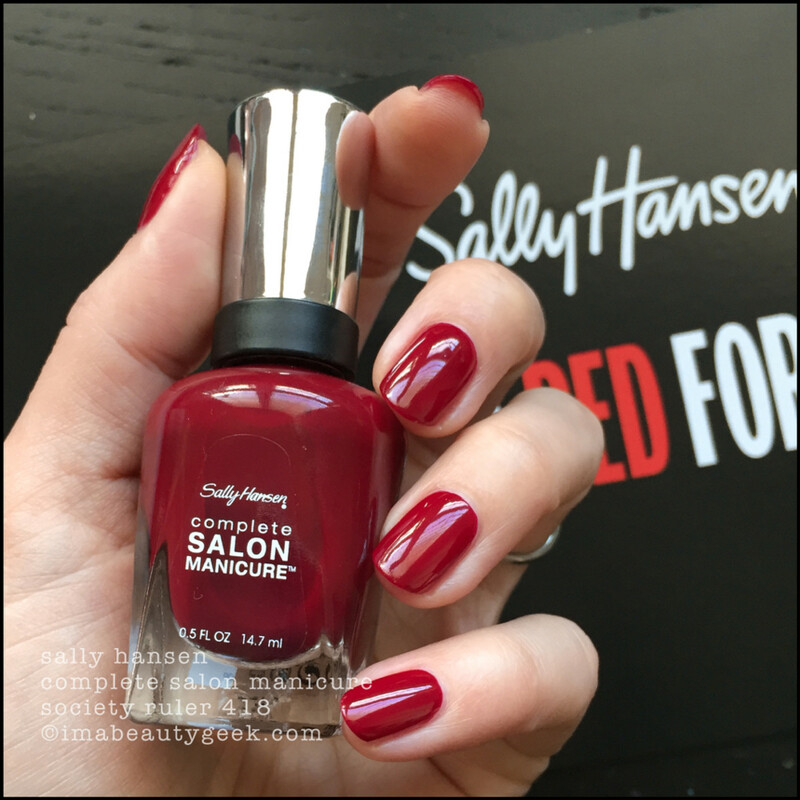 Sally Hansen Berry Fancy 809 – Red/esign Collection 2018 (above). Not red. Not. Instead, it’s a dusty kind of terra-cotta-plumberry thing that just screams Autumn. I really do like this shade, but I think I’d like it even more if it was in a Fall collection instead of a red collection. You know what I mean, right? 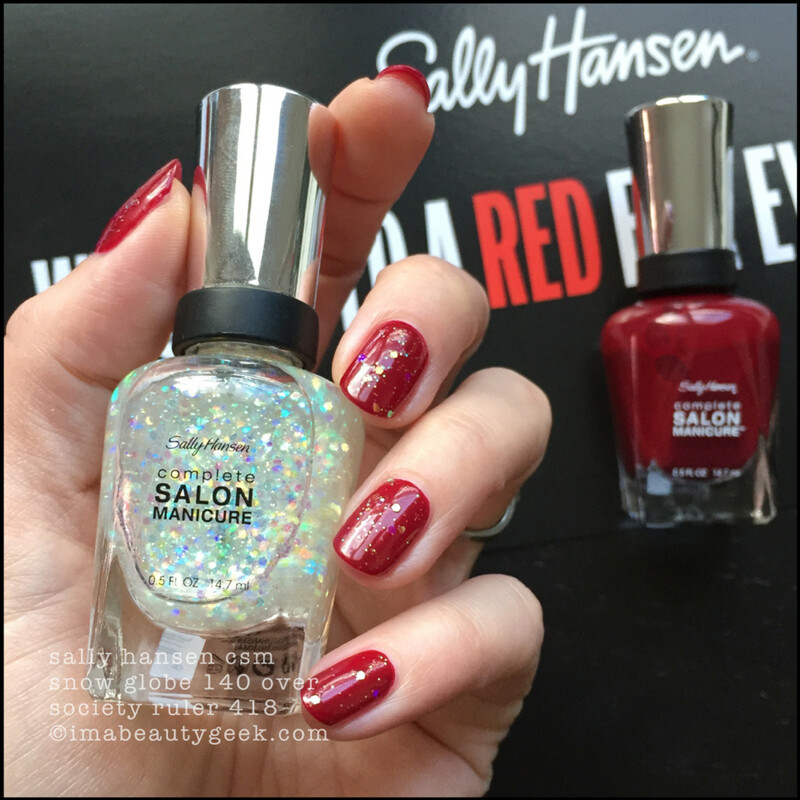 Sally Hansen Belle of the Ball 641 – Red/esign Collection 2018 (above). And lastly, this beautiful shade of #NotRedButNiceTrySally. Okay, let’s not look at this as part of a collection of reds but let’s look at it as a stand-alone shade. That’s 2 coats and if your heart didn’t just do a little pitter-patter, you’re clearly broken, need an intervention, and we can’t be friends anymore. I mean it. So there you are! 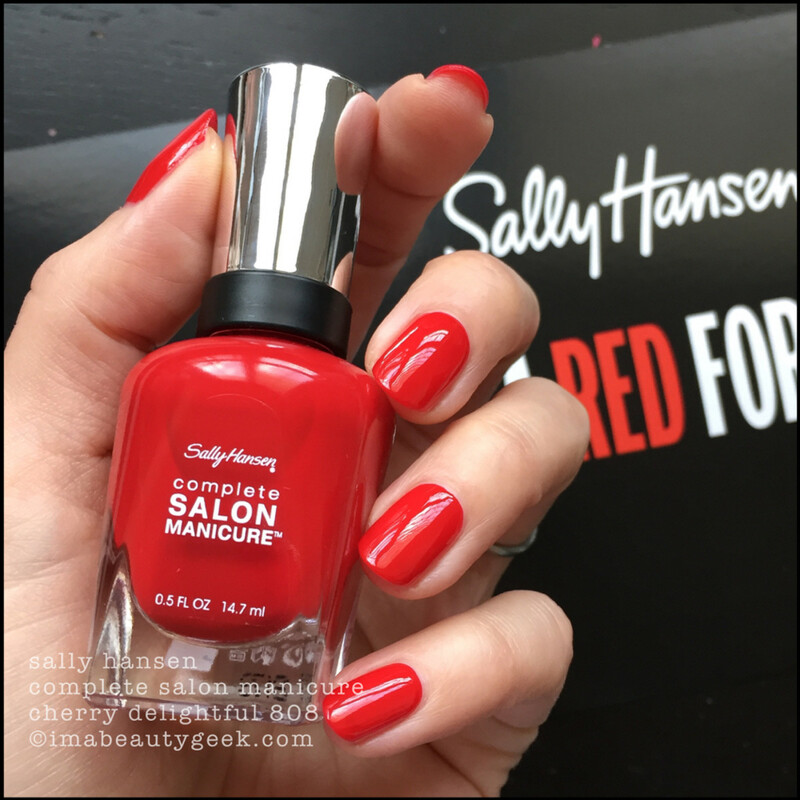 Sally says “Now you can show off your best red with the Complete Salon Manicure RED/esign collection, which includes nine perfectly beautiful shades for every woman that never go out of style”. Do you red? Huh? I don’t. Why? Because red is a swatcher&apos;s worst nightmare. If I weren&apos;t a swatcher, there are a couple shades in here that speak to me. Weirdly, neither of them is what I’d ever in a jillion years call “red”. Oh! Oh! Availability? In , you should be able to find &apos;em at your usual mass-market retailers, drugstores, or here at this linky from amazon.ca, too! PostScript: I begged Nick to let me paint Cherry Delightful on his nails so we could see if it is (in actual fact) a universal shade. He declined. He’s a party pooper. PostPostScript: People be askin’ if Belle of the Ball is anything like OPI’s Every Month is Oktoberfest and the answer is yes. 98% dupetastical. That 2%? Well, the formula on the Sally is perhaps marginally better. Shhh… don’t tell OPI I said that, k? manicures & photos karen falcon (she loves her new tea mug from David’s).